PIG ISLAND is Mo Hayder's fourth novel and her second standalone after 2004's TOKYO. 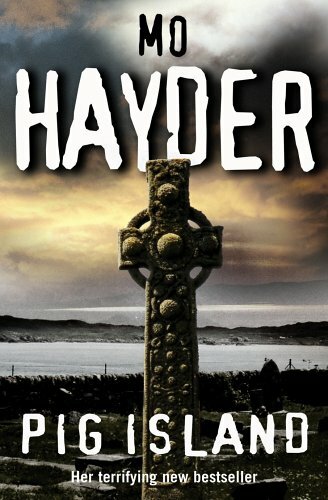 Hayder has a well-founded reputation for writing grisly stuff and the tag line on the review copy is "you won't have nightmares... because you won't sleep" which is a bit worrying for a reader who has a fondness for cat solving cozies. Nonetheless I made it to the end and though a bit gory in parts it wasn't as graphic as I'd feared. Joe Oakes is a reporter who debunks myths and reveals hoaxes and he is drawn to the Scottish island of Pig Island where amateur film footage has shown a humanoid creature with a tail running on the beach. Oakesy is invited by the Psychogenic Healing Ministries, a cult which lives on the island, in order to show that they are normal and that there's no 'devil' running around. What the cult doesn't know is that Oaksey, under the by-line of Joe Finn, wrote an article several years before, which showed the cult leader, Pastor Malachi Dove to be a fake and led to Dove fleeing to Pig Island, but not before Dove threatened to take the reporter 'Joe Finn's' peace of mind away. Oaksey visits the island and discovers that Dove has apparently gone mad and lives on the other side of the island. The remaining thirty or so members have security measures to keep him or something worse than him out of their side of the island and some of the group believe they have seen the 'devil'. Oaksey, harbouring a hatred for Dove, rooted in their first confrontation, naturally disobeys the rules of the cult and seeks out Dove. The consequences of this meeting underpin the rest of the book. The story is narrated alternately by Oaksey and his wife Lexie who has chosen to accompany Oaksey and their voices are quite distinct. PIG ISLAND is written in an easy to read style which belies the strangeness and increasingly nasty tone of the tale. The gory bits are mostly about dead and dismembered pigs but there are also a couple of unpleasant scenes surrounding human deaths. The tension is maintained until the shocking end which has a very 'Tales of the Unexpected' twist and one that leaves you a little ambiguous about what had actually happened before.